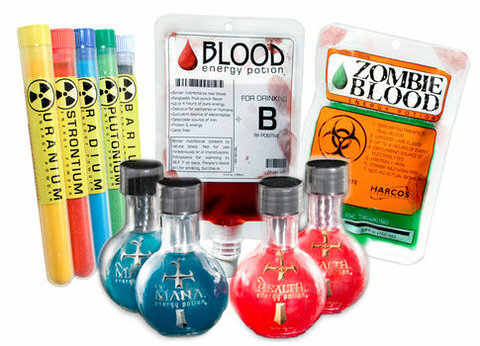 Tiger Blood, Zombie Jerky, and Radioactive Sherbert. WTF! Written by William on May 8, 2011 and posted in Uncategorized. Sometimes people sell the coolest things. I was on a forum the other day and a friend posted a picture of what he had just found in a local shop. 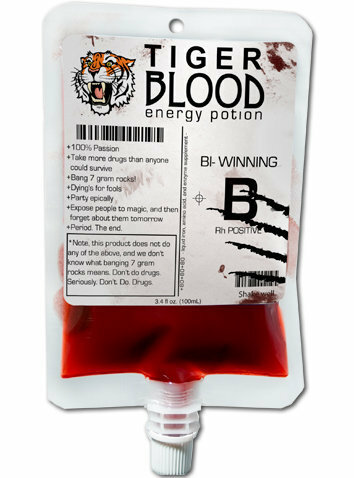 Can I just say right now that it’s not actual tiger blood here, it’s an energy drink. Can you see what that says on the package? What’s that all about. Underneath it says it does none of these thins. They don’t know what banging 7 grams rocks means and tell you never to do drugs, just like a good little boy. So I did some research into this Tiger’s Blood and it turns out there are others. There are 3 products in these “blood packs”. There’s the Tiger’s Blood, Human Blood and Zombie Blood. Ant there are also other products as well. All loaded with caffeine to keep you going. There’s the radioactive sherbert, and numerous potions like mana potions and health potions. Love potions and luck potions are also available. There is another product deserving of a mention. ZOMBIE JERKY!!!! Green beef jerky! It looks freaky. Harco Laboratories are where these come from. And here’s the link to the shop.